The flow of the application is broken down into three distinct steps that progress from a grammar to the completed parse tables. The developer advances by clicking the "Next" button which is located on the bottom left side of the main window. 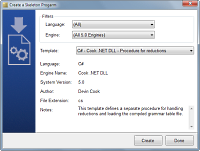 This is similar to the interface commonly used by installation software and application "wizards". Most errors that occur in grammars are found in the LALR State Table. When the system analyzes a grammar and computes the parser tables, often shift-reduce and reduce-reduce conflicts occur. The LALR State Browser allows the developer to review the produced states - in particular the state that contains the error. One of key features of the Builder Application is the Test Grammar Window. After the grammar has been successfully compiled by the Builder, the developer can check how Deterministic Finite Automata and LALR algorithms will analyze any number of test cases. 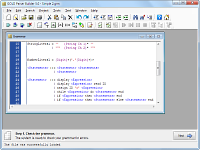 The GOLD Builder can export the grammar and computed tables to a webpages, formatted text, and XML. In the case of the webpage, it makes full use of cascading style sheets, which, in turn, makes changing the design easy. 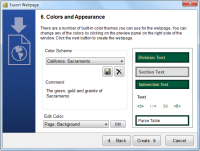 The Builder comes with a large number of pre-defined color schemes. You can, if you want, create your own and save them for later use.